I love Irish Chain quilts. My mother made me a double Irish Chain queen size quilt for my wedding that resided on my bed for years. After the children "loved" it a little to much I decided it was time to make a new one. I wanted to make an Irish Chain Quilt but add some Modern twist to it. So I began designing. My design started with a simple Single Irish Chain, a very large Single Irish Chain. Then I started adding "braids" for that modern flair. And wha-la, The Braided Irish Chain pattern was created! I had some much fun designing this quilt and was so surprised and pleased with the secondary patterns that came from it. Oh, and tomorrow is February 1st, and you know what that means, the start of my Quilt-A-Long :) See you tomorrow!!!! Awesome quilt Melissa! I love your twist on the classic design and I can't believe you did it all in 2 weeks! 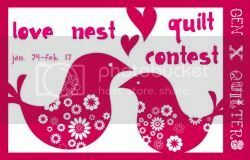 Thanks for entering it in the Love Nest Quilt Contest and best of luck! BTW, for the contest the quilts just need to be bedsize - not necessarily queen (ie twin is ok) - just to clarify! Lovely quilt Melissa. Irish Chains are so charming - single, double, triple - a heritage pattern. See you tomorrow. What a beautiful quilt. I love how the pattern goes. Stunning!! that is so fantastic Melissa, I'd be interested in doing this too! Melissa ~ I just love the look of this quilt. It's awesome looking. Great job.